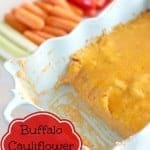 Buffalo Cauliflower Dip is extremely tasty, spicy, cheesy, flavorful, and addictive! It is a crowd pleaser and will disappear quickly! It is perfect with vegetables! Cut cauliflower is large chunks. Steam until tender. Combine all ingredients in a food processor. Process until smooth, but with a few chunks. Spread mixture in a baking dish, top with cheddar cheese. Serve with carrots, celery, and red pepper strips.